A storm passed through today but we had our nose to the grindstone, our fingertips to the chicklets, our mind on a few reviews. And our ears were busy too with another briefing. So we didn't get out until sunset. Last Year. Canon XTi, 18-55mm at 50mm, f7.1, 1/4000 second and ISO 400. Still we wanted to celebrate the rainfall with an image. So we dipped into the archives and found this one from almost a year ago. 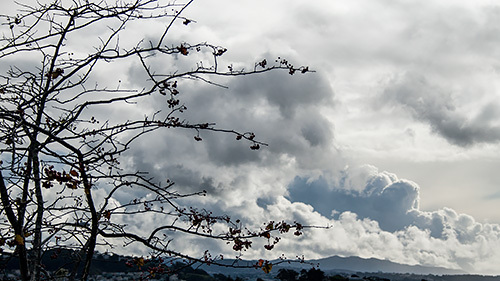 You're looking south at San Bruno Mountain through a nearly leafless tree against the passing clouds. We made a 16:9 crop of it to emphasize the flow to the right, although the wind blows everything left. And we did very little else to the DNG. A little more contrast, a little blacker blacks. Very, very little. We shot it with the camera we usually take on our walks, a Canon Rebel XTi and we shot Raw, converting to DNG before we worked on the image in the new Photoshop (about which we'll have more to say shortly).